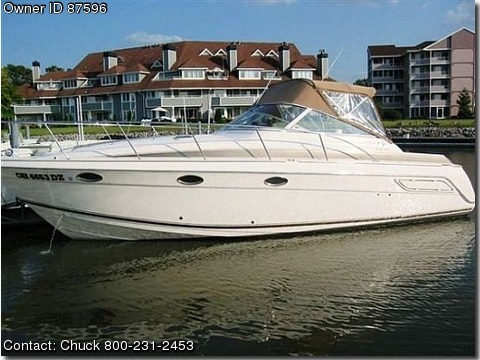 High-performance mid-cabin cruiser from combines brisk performance and roomy accommodations. Notable features include a well planned interior with berths for six, good helm layout, and a comfortable cockpit. The head compartment is just inside companionway, conveniently close to cockpit; folding door provides genuine forward-stateroom privacy. Faster than many so-called sport-boats, twin350hp I/Os cruise at 30 knots and reach 45 knots.